600 bags of letters, cards and Christmas parcels from loved ones have been delivered to sailors on board Portsmouth warship HMS Illustrious. 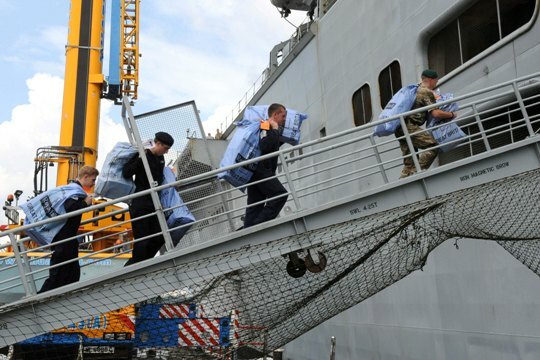 The amphibious helicopter carrier was one of two Royal Navy warships sent to the Philippines as the UK's contribution to the humanitarian aid effort following the typhoon. HMS Illustrious' ship's company will now be away from Christmas as she makes the long journey home - but the delivery of 600 bags of mail from families and loved ones helped soften the blow for her personnel. 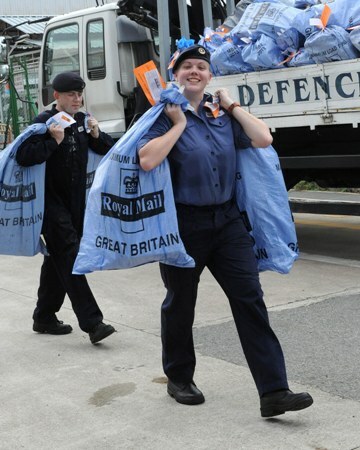 "I understand that this is by far the biggest mail delivery that the British Forces Post Office has made for a long time. A lot of the mail had to be diverted from other places after we were re-tasked at short notice to go to the Philippines. Even so, we were staggered at the sheer amount of mail that has arrived. I think that BFPO may be able to teach Father Christmas a few things about making sure that the right parcels get to the right place!" "Tilly and the BFPO team do an amazing job. I know how hard they have worked to make sure this delivery was made in time for Christmas. That said, I am sure there must be more on the way - I have only received one parcel so far!" HMS Illustrious has completed her aid operation and is now on the long voyage home. The remaining crew of around 530 men and women are expected to be reunited with their loved ones in early January.